Simply plug any 48V PoE powered ethernet cable into one port, and any 8-30V capable RouterBOARD device into the other. This device is capable to provide high power output - up to 24W (up to 1A at 24V). 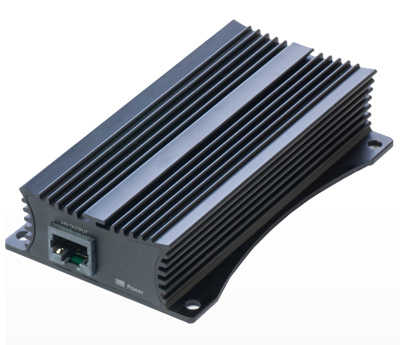 The device is a rugged metallic design, with high quality components and integrated heatsink design. The case also has mounting holes so you can attach it to a wall. Ethernet shield pins are inside the Ethernet connectors, so that shielded ethernet can be used, to ground either at the converter itself, or at the devices at both ends. OEM Mikrotik Rack Mount Kit for RB4011 Router - black finish with screws Mikrotik RouterBoard RB4011iGS+5HacQ2HnD-IN (Export version) Powerful 10xGigabit port router with a Quad-core 1.4Ghz CPU, 1GB RAM, SFP+ 10Gbps cage, dual band 2.4GHz / 5GHz 4x4 MIMO 802.11a/b/g/n/ac wireless and desktop case - New! Mikrotik RouterBoard wAP LTE kit - (just add LTE card of your choice) - New! Mikrotik Cloud Router Switch CRS328-4C-20S-4S+RM SFP switch, 20 SFP ports with 4 SFP+ cages and 4 combo ports in a 1U rack mount case - New! Mikrotik ACGPSA is standalone active GPS antenna, that works in 1575.4 MHz spectrum - New! Mikrotik RouterBoard CCR1036-8G-2S+EM Extreme Performance Cloud Core Router with 8-10/100/1000 ethernet ports, 2 SFP+ ports and RouterOS Level 6 license - New! 24vdc 96 watt (4 amp) open frame switching power supply with Molex DC plug - replacement PSU for Mikrotik Cloud Core Routers 48V2A96W Mikrotik 48vdc, 96 watt (2.0 amp) switching power supply with 2.1mm DC plug Mikrotik RBSXTsq5HPnD (export version) is a low cost, high speed 5GHz wireless device. Dual polarization 802.11n and Nv2 TDMA technology help to achieve even 200Mbit real throughput speed - New!